I’ve found an interesting game that can be used both as icebreaker and for teaching a fundamental lesson about the importance of prototyping before fully committing a project (sounds lean? Oh yes, it is!). 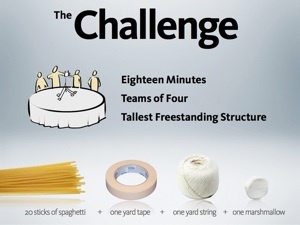 It’s called the Marshmallow Challenge and can be run by groups of 4, there is no age constrain and requires less than 20 minutes. Each group has 20 spaghetti, 1 meter of tape, 1 piece of string and 1 Marshmallow. The challenge is to build with them, within 18 minutes range, a self-sustaining structure with the Marshmallow on top of it. The winner is the group that achieve the maximum height between the Marshmallow and the table. Next Post Converge Hackathon: developers + designers + diversity. Is it even possible?